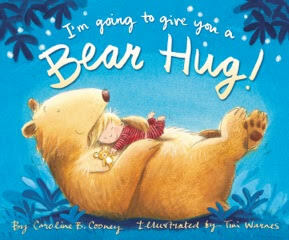 I’m Going to Give You a Bear Hug!, written by bestselling author Caroline B. Cooney, is a playful and comforting bedtime book that imagines all the wonderful ways a child might give and receive a hug. 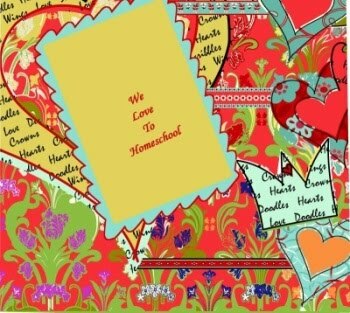 Whether it’s a big bear, gasp for air, knock over a chair hug or a wet and drippy, slimy, slippy fish hug, children will giggle their way through all the imaginative examples. Cooney’s sweet and simple rhymes encourage playful interaction between parent and child and ultimately help them wind down before they snuggle into bed and drift off to sleep. I’m Going to Give You a Bear Hug is a sweet loving bedtime story book that is also sure to become a Valentine’s Day favorite for little ones who enjoy celebrating a day full of hugs and kisses from loved ones. I read this book to my 3 and 8 year old daughters for their bedtime story. I expected it to be cute. But I never imagined the reaction that I would get from my daughters. Or the giggles that would ensue during and after the story. Oh my word, it was so precious. The story follows a little boy and his teddy bear getting ready for bed, and along the way they discover lots of different ways to give a hug. Hug like a dog. Hug like a cat. Hug like a fish. The illustrations are cute and cuddly. The dialog is a cute sing-song type of prose. As we would read about each type of hug, my 3 year old would giggle and point at the illustrations. I was surprised just how much she enjoyed. After we finished reading, my 8 year old insisted that we act out each type of hug ourselves. Their favorite was the wiggly giggly bug hug which involved lots of tickles and laughter. Super cute bedtime story which can lead to lots of super cute hugs with your little ones. About the Author: Caroline B. Cooney was born in New York, grew up in Connecticut, and now lives in South Carolina. Caroline is the author of 90 Young Adult novels in many genres, and her books have sold over fifteen million copies. I’m Going to Give You a Bear Hug is her first picture book. It’s based on a verse she wrote for her own children, Louisa, Sayre and Harold, who are grown now. Zonderkidz™, the children’s division of Zondervan, inspires young lives through imagination and innovation. As the leader in Christian children's communications, it creates products that awaken the hearts and touch the souls of kids under 14. Zonderkidz is also publisher of the NIrV (New International Reader’s Version) Bible translation, the third grade reading level edition of the NIV. For additional information, please visit www.zondervan.com. Zondervan is a world-leading Bible publisher and provider of Christian communications. Zondervan, as part of HarperCollins Christian Publishing, Inc., delivers transformational Christian experiences through its bestselling Bibles, books, curriculum, academic resources and digital products. The Company’s products are sold worldwide and translated into nearly 200 languages. Zondervan offices are located in Grand Rapids, MI. For additional information, please visit www.zondervan.com. GIVEAWAY: On February 11th, I will choose one reader to receive their own copy of this adorable book. Just leave a comment on this review or on the Facebook post. Residents of the continental U.S. only. I rarely find time to read, and when I do, it is usually non-fiction. Ways to do better at "this" or ways to better understand "that". It is rare indeed that I find the time to read fiction just for the satisfaction of reading a good story. But when I read the description of this book, I was intrigued and decided that I would like to read and review this book. Maybe it was my southern roots, my love of all things Texas, or that my grandmother was also named Ruby. Whatever the reason, I needed to read this book. And so I did. And it was so much better than I even expected. I read way too late into the night, because every time I hit the end of a chapter, I just had to know what happened next. I immediately identified with Juliet and fell in love with her grandparents. Everyone deserves a grandmother and grandfather like Juliet had, but unfortunately too few grandparents fit the bill. The southern girl in me is about ready to pack up and leave New York to head for Fireside Texas. So what are some of the highlights? 1. Family. Families should love each other...family should stick together, no matter what. A person can't truly learn to be themselves, if they are afraid that the ones they love may walk away. 2. Forgive. We have to be willing to forgive, even if the offender isn't sorry. We can't truly grasp our future, if we are still stuck in the pain of our past. 3. Memories. On our lowest and darkest days, a pleasant memory from the past can serve as the sunshine lighting our path, giving us the strength to press on. Would you like to purchase the book? 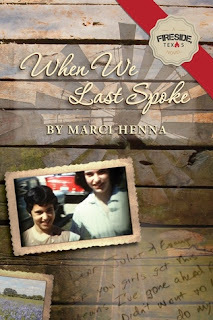 GIVEAWAY: On February 9th, I will choose one reader to receive their own copy of this fantastic book. Just leave a comment on this review or on the Facebook post. Residents of the continental U.S. only.